What We Love About Crown Molding | Mahogany, Inc. Put the crown on your interior design and live like royalty with crown molding. Crown molding can not only enhance the aesthetic beauty of your house and home, but increase its value. In recent years, there has been an increased awareness about the benefits of molding. It is not only beautiful but practical for design as it involves perfect cutting-in and edging when leaving a room. In the 1950’s and 60’s, crown molding somewhat fell out of fashion, as stark minimalism became the design standard, leaving people often unsure how to handle it as the trend reemerges in modern home design. The return of classical inspirations and the influence of French country styles are changing the game, but require a degree of know-how and care. Read on to learn about fashion-forward way to incorporate this beautiful home design trend into your living space. If your home was built before 1920, sprucing it up with crown molding will be a snap. These homes were designed to accommodate opulence, so the frillier and more intricate your molding, the more in place it will seem. You can even double or triple crown molding if your ceilings are over ten feet tall. As long as you opt for high gloss, bright white crown molding to contrast with whatever paint you choose, it will look timeless and evoke old world elegance. The benefit to crown molding in mid-century homes, especially those designed between the 1930s and 1970s, is that it can lend support to older plaster walls and ceilings and help prevent cracks, even as it adds aesthetic value. 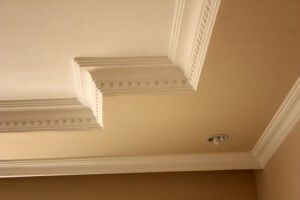 If your home has a rounded plaster ceiling, however, crown molding will not be possible. In straight edged rooms in mid-century homes, mitered molding in a geometric pattern looks best. Think clean and sharp edges. If your ceiling is shorter than nine feet, crown molding that is four inches high or less will be the most flattering. For homes built between the 1980s and 1990s, finding crown molding to suit them can seem tricky. It is however, highly possible. The popular popcorn ceilings of this era look amazing with sharp crown molding. The trick is to keep the it small and match it to your paint in order to make short ceilings look taller. If your modern home has taller ceilings, both classic victorian crown molding and more streamlined contemporary crown molding will suit it well. Mahogany, Inc. is a general contractor specializing in quality construction for projects across a wide range of industries. Located in southwest Baltimore, we employ 100 persons, and are one of the largest minority-owned businesses in the state of Maryland. Make sure to check back with our blog every week! This entry was posted on Friday, March 4th, 2016	at 7:38 pm	and is filed under Millwork	. You can follow any responses to this entry through the RSS 2.0	feed. Both comments and pings are currently closed.